We worshiped today at the Wadi Qilt. This place inspired Psalm 23 — though it’s not exactly “green pastures and still waters.” Amid the dry and seemingly barren landscape one can see crisscrossing trails of sheep over the years. There are a few tufts of vegetation. There is dry creek/river bed that would become a raging torrent of water to sweep away any sheep unfortunate to be caught in its power. 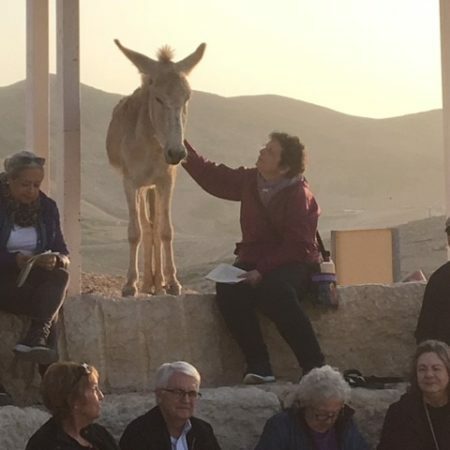 What is the way through from Jerusalem down to Jericho (as Jesus imagined in the parable of the Good Samaritan)? What is the way through our barren and threatening, seemingly lifeless places and experiences? That’s the question … and the promise … inspired through the psalm. It is again poetry rooted in topography / geography, and people’s real experience in the place. From the beginning of the Bible to its end, as in the well-known and loved phrases of Psalm 23, we trust the promise that God is with us. We began this day with renewal of baptismal vows in the Jordan River. We end worshiping in the Wadi Qilt. From the beginning of our lives to our last breath, Holy Love claims us and calls us to find a way to love others. The Holy One walks with us in Jesus Christ, leading us in right paths. As we give our hearts to that promise and purpose, ever in God’s grace, our souls will be restored in peace; even in the darkest valley of death, we will not fear; yes, we will dwell in God’s presence forever. 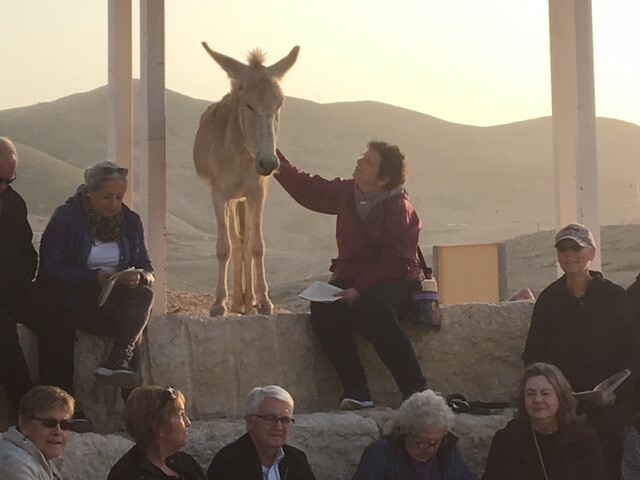 A donkey wandered up and joined our worship standing still the entire time clearly, attentively moved by the Spirit!